Originality in video games is overrated. I see no better proof of that today than Shadow of Mordor. The game shamelessly borrows its combat from the Batman: Arkham series, to give one example. But it also introduced the "nemesis system," which is one of the most provocative and original ideas I've seen in a long time. 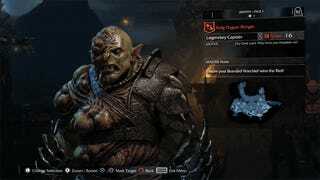 Would Shadow of Mordor be such a resounding success if it didn't copy-paste elements from the Arkham and Assassin's Creed games quite so liberally? Maybe. But invoking well-worn motifs from similar pieces of work also grants gamers something comfortably familiar to latch onto. As I noted in my review, doing this gives Mordor's best parts time and space to take shape, and ultimately add up to something that feels truly groundbreaking. So if the price of admission for Shadow of Mordor is playing something that feels a lot like Arkham City, then that's a price I'm willing to pay. Plus: we have to consider what Mordor's peers will do now that gamers have taken to the nemesis system so eagerly—which is all the more impressive considering that they don't (completely) understand how it works yet. I bloody loved this game. What it stole, it improved upon, be it AC's openworld design rhythms, or Batman's combat system. Crucially, they did a brilliant job of bringing freshness to the game via their Nemesis system and adjoining mission structure. Much has been made of it, both by the marketing campaign and by players. And it's great, but I think I like it for different reasons to most gamers. This [the nemesis system] is a great system. Pretty damn repeatable too, no reason that an indie game couldn't do this on a text level. Arguably many do similar (FTL comes to mind as an example of a game I've built similar relationships within). There will of course be a whole heap of clones of this system, directly as a way of giving NPCs character, but it's worth thinking beyond that. If the lesson is 'make players care about locations, characters and events through randomisation, persistence, reaction to player actions and implied actions off screen' then one can see similar stat based meta stories occurring far more diversely. It's one thing for me as a gamer-turned-critic to think excitedly about what future Grand Theft Auto, Assassin's Creed, Arkham...heck even Far Cry games might look like if they introduce dynamic nemesis system-like infrastructures into their open worlds. It's something else entirely to hear a one-man game development army say that the nemesis system isn't just a "great" idea, but a "pretty damn repeatable" one too. Something much more exciting, if you ask me. And a little odd, since it doesn't sit all that comfortably with Mordor developer Monolith's explanation for why the nemesis system might not be so...robust when it comes to the Xbox 360 and PlayStation 3. All I have to do is skip on over to Destructoid to see that some other gamers are just as interested in the idea of applying the nemesis system to a sim game as I am, to give one silly example of how excited gamers are. So let me ask you: what's the ideal game that you'd like to see enhanced by stealing some of Shadow of Mordor's best ideas?